Having served home remodeling needs for many years, DFW Improved is often asked what’s so popular about kitchen remodeling in Allen TX. So we thought we would share an example of this home remodeling project we recently completed in the rapidly changing city of Allen. As many people are considering home improvement projects, kitchen remodeling becomes one of the first things you think of. After all, many families spend more time in the kitchen than any other area of the house. Since the kitchen is such a popular place, it tends to get worn down pretty quickly. Below is short video of one of our recent projects – kitchen remodeling in Allen, Texas. As you will notice in the ‘before’ section of the remodeling project, this kitchen required a decent amount of work. First, there was an existing load bearing beam that needed to be removed. In order to do this, we had to place a steel beam in the wall supporting the bedroom above. Second, you will notice standard oak finish cabinetry that is very common in older homes in Allen TX and across similar communities of DFW. You will also see older backsplash and oak railing along the countertop edges. Believe it or not, as you can see in the ‘after’ picture, we were able to use much of the standard cabinetry only to add a little. The secret here was refinishing cabinetry with a gel stain. We think our kitchen cabinet contractors are brilliant in this area. Last, but definitely not least, was the kitchen lighting changes that help create the environment the homeowner desired. Many people overlook the importance of kitchen lighting and we often times look genius for some of the simplest things in home remodeling. Kitchen lighting is one of those home improvement areas that often make us look genius when it just takes some design work and lighting expertise to choose the best kitchen lighting for a home. Although there is sometimes more cost here than people realize, the visual appeal can be great. This kitchen remodeling in Allen TX took the DFW Improved team about six weeks to complete the project, and it helped this home in Allen regain it’s beauty. You can see more of our work in our photo gallery, and follow us on Pinterest, Facebook, YouTube, and Twitter. Ready for Your Own Kitchen Remodeling in Allen TX? 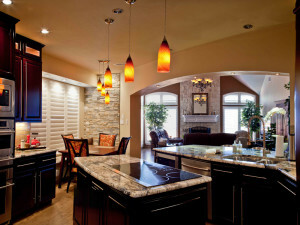 If you are interested in remodeling a kitchen or any other home remodeling projects, give us a call at 972-377-7600.